When does Oracle update Eloqua? Changes and enhancement to the core platform. Changes and updates to the Apps. Each release is numbered, for example this current release is Eloqua release 482 (Aug 9 -21, 2016). These changes range from visual changes through to core underlying system or platform changes or enhancements. Just like you add apps to your smartphone, Eloqua has hundreds of apps available to enhance the performance of your campaigns. These updates are also numbered, the most recent update is Eloqua Apps release 224 (July 22, 2016). The release schedule, available on Topliners*, lists the dates your POD will be updated. If you’re unsure which POD your instance of Eloqua sits, you can see that in the URL once you’ve logged in. See the screen shot below as an example. On which POD is your instance of Eloqua? In this screen shot, Eloqua is on POD 1 “p01”. At this stage, POD’s range from 1 – 7. The first thing you need to do is create yourself an account with Topliners. Access is free and open to all Eloqua customers. Once you’ve created an account, click on the red button “Oracle Marketing Cloud Customers” as shown below. 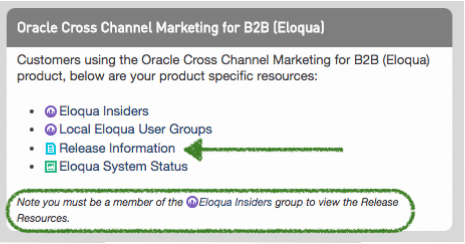 Then access “Oracle Cross Channel Marketing for B2B (Eloqua)” and the link to “Release Information”. Click here to visit Topliners then click on Register in the top right hand corner. NOTE* In order to access the release information, you will need to be a member of Topliners and then also a member of the Eloqua Insiders group to view the Release Resources. Release 482 brings some significant visual changes to Eloqua, nothing that will cause you to not know what you’re doing, just some good enhancements. 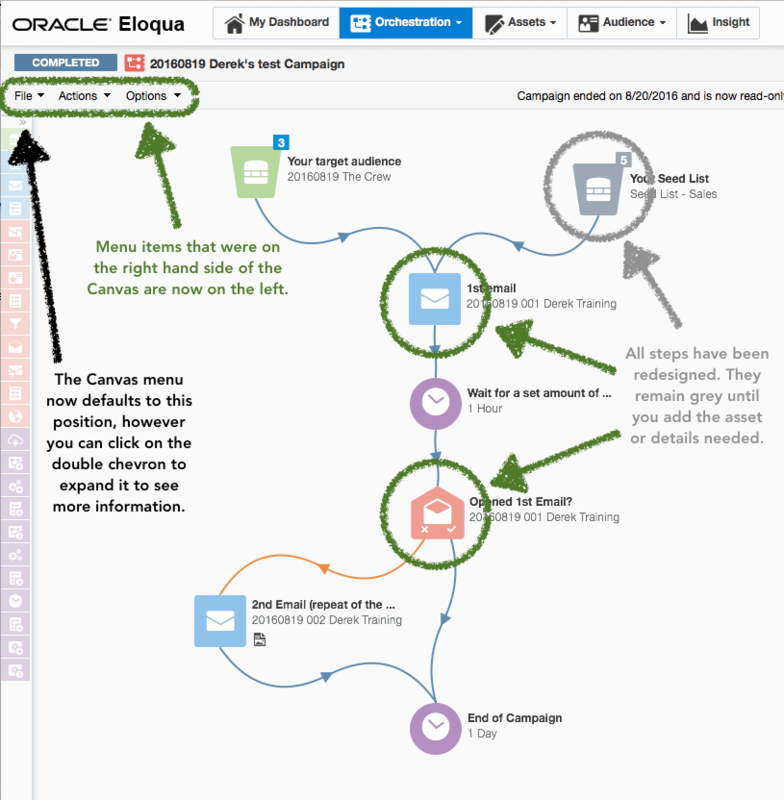 The Campaign Canvas is now visually inline with the Program Canvas. Just like the previous version, all steps remain grey until you add the asset or details needed e.g. the Wait step. Updates include the ability to listen for lead score changes, compare dates decision step, and re-evaluate segments daily (Program Canvas is part of Eloqua’s Controlled Availability program). You can now group progressive profiling fields and easily switch between between list and group modes, and drag and drop contact and account fields. Staged mode allows you to decide which contact fields are displayed together and on which visit they appear to the contact. Unlike List mode, you do not have to have a static number of fields to display, as different stages can have a different amount of fields, so you can coordinate for certain fields to appear together in accordance to how many times the contact has filled out the form. Different stages are divided by a dotted line. >> Click on the image below for a larger view of the screen shot. After 7th Oct, 2016, you will no longer be able to add new instances of pre-existing Cloud Connectors or Cloud Components to your Eloqua10 Campaign Canvas or Landing Page. Only Apps built on the new framework can be used in your new Eloqua10 Campaigns and landing pages after 7th Oct, 2016. Instances of Cloud Connector Apps on E10 Campaign Canvas will be replaced with a holding step. Contacts will not automatically pass through this step. Instances of Cloud Components on E10 Landing Pages will be removed. The landing pages will render without the externally sourced content. With the volume of changes taking place each quarter, we’ll share these with you via our blog and to members of our Eloqua User Group. If you have any questions about these changes and how they may affect your campaigns, click here.